The Cubs benefited from the fact that for two games the Pirates' offense was even less effective. Chicago won the first two games by identical 1-0 scores, with Ian Happ and Kyle Schwarber providing the homers. Their luck ran out Saturday when Ben Zobrist hit a solo homer but Pittsburgh got to spot starter Tyler Chatwood in the second inning for three runs in a 3-1 win. [post_ads]The first-place Cubs (71-51), who had their three-game winning streak snapped, probably can't count on securing a series win with a single run, especially against National League Central opponent Pittsburgh (62-62), which halted a five-game losing streak and is desperate to remain in the wild-card race with a split of the four-game set. Pittsburgh is fourth in the division, 10 games behind Chicago and six games out of the second NL wild-card spot. "We know we're not that far out of it," said the Pirates' Joe Musgrove, who started and won Saturday. "We know we have the team to do it. We've got the players. Everyone's on board. This is the point in the year where we can give in and say, 'We made a good run at it. We'll get them next year,' or we can fight and try to make that final push. ... We're on the verge of going on another tear." The Pirates have gotten on base effectively this series, but getting runners home was tough before Saturday. "When you're struggling, you've just got to outwork the slump, and you know it's going to come around and we're going to get hot again," said Pittsburgh left fielder and leadoff hitter Corey Dickerson, who was 3-for-3 with a double and a walk Saturday. Chicago left-hander Jose Quintana (10-9, 4.46 ERA) is scheduled to face Pittsburgh right-hander Jameson Taillon (9-9, 3.66) on Sunday. Taillon has allowed three or fewer earned runs in 14 straight starts and in 21 of his 24 starts this year. He has pitched into the sixth inning in 13 of his past 16 appearances. Most recently, he gave up three runs and seven hits in six innings Tuesday in a 5-2 loss at Minnesota. That was the second game of the losing streak and left the team frustrated. "If we're not playing well, it gives other teams the chance to gain ground," Taillon said after the Twins had a three-run fourth inning. "I'm not going to sit here and say I made great pitches when I give up hits. Apparently, I need to make them better, so I don't know. Nothing was wrong physically or anything that inning. They hit some pitches, and I need to make better ones." Taillon is 3-3 with a 4.86 ERA in six career starts against the Cubs, including a 5-4 win July 31 in his only start against them this season. Quintana has been off recently, going 1-3 with a 7.52 ERA in his past four starts.On Tuesday against Milwaukee, he gave up five runs on three homers in five innings in a 7-0 loss. He said his curveball "was too much in the middle. The location was off." 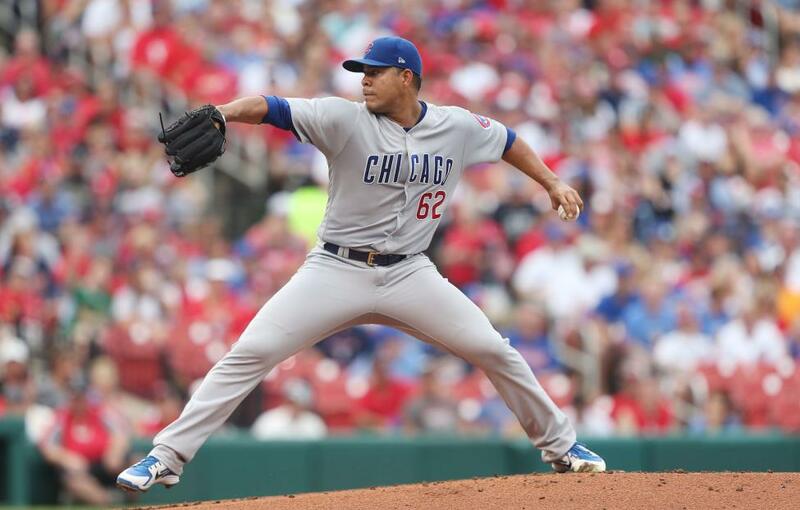 Quintana is 1-1 with a 3.00 ERA in three starts versus the Pirates, but he has not faced them this season.